Update: Conditions at the Honduran prison. More than 350 inmates at the Comayagua Prison Farm, 45 miles north of the Honduras capital Tegucigalpa, have been trapped and killed in a fire. At least 300 inmates are still missing and presumed dead. Around 475 inmates were able to get out. 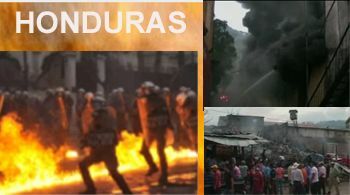 It is the largest and worst prison fire in Latin American history.